Check out our photo gallery of the explosion here. An explosion on the UC Berkeley campus near California Hall injured several people, prompting officials to declare a state of emergency and order an evacuation of the campus about 6:40 p.m. Monday evening. Three people were treated on scene for injuries, and one was transported to a hospital with minor burn injuries, according to campus spokesperson Dan Mogulof. At least 20 people were stuck in elevators as a result of an earlier power outage but were freed by 9 p.m., Mogulof said. The explosion appears to be related to vandalism discovered by the campus late last week, Mogulof said. Vandals were stealing or attempting to steal copper grounding wire from an electrical system not readily visible, and the damage appears to be more extensive than initially believed. The explosion occurred as engineers were restoring power after a campuswide outage about 4:45 p.m., Mogulof said. The explosion originated in an underground vault beneath a road by California Hall near the center of campus, said UCPD Sgt. Andrew Tucker. At least four ambulances, fire trucks and multiple police units responded to the incident. An ammonia leak in Latimer Hall, likely related to the power failure, was contained by Berkeley Fire Department about 6:20 p.m., said UCPD Lt. Marc DeCoulode. Daily Cal multimedia producer Miles Mathews captured the billowing fire after an explosion on the UC Berkeley campus. After the explosion, officials instructed everyone to evacuate the campus through the north and west entrances. They also advised people to stay away from manholes on campus. At 5:30 a.m. on Tuesday, campus officials announced that power had been restored to most buildings on campus and that most classes will meet as scheduled. Eleven buildings remain without power and are not operational: Alumni House, Bancroft Library, California Hall, Central Heating Plant, Doe Library, Durant Hall, Dwinelle Hall, Dwinelle Annex, Edwards Track (East and West areas), Haas Pavillion and EH&S Facility, according to the UC Berkeley public affairs website. Students should assume classes are cancelled in these buildings for the day and should check in with departments to see if and when classes and events will be rescheduled, and employees in these buildings should check in with supervisors about reporting to work, the website said. 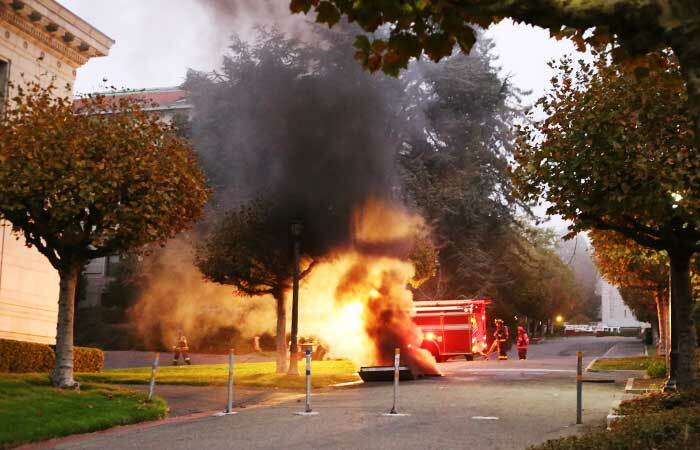 Daily Californian online managing editor Seung Y. Lee took video footage of a plume of smoke erupting from campus as the explosion took place near Wheeler Hall. Freshman Henry Rowswell described the explosion as a “fireball” that was as tall as California Hall. Martina Baccari, a Berkeley High School student who was on campus at the time of the incident, said she felt heat in her face directly after the explosion. 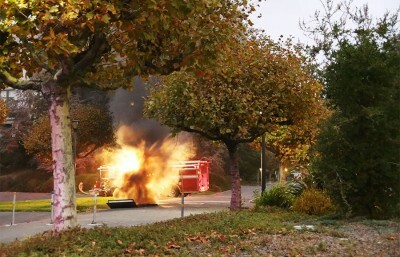 Shortly after the power outage, smoke was seen rising from an old power generator near Bancroft Library that kicked in when power went out, said UCPD officer Barry Boersma. It is unclear whether the two incidents are related. At 6:05 p.m., the campus sent out an alert through its emergency text message system canceling classes and shutting down lab operations for the rest of the day. The outage affected buildings from Strawberry Canyon to University Hall, including the chancellor’s residence, said Christine Shaff, communications director for Facilities Services. Student housing Units 1, 2 and 3, Maximino Martinez Commons and Foothill also were affected. The residence halls affected by the outage were being powered by generators Monday evening, Mogulof said. 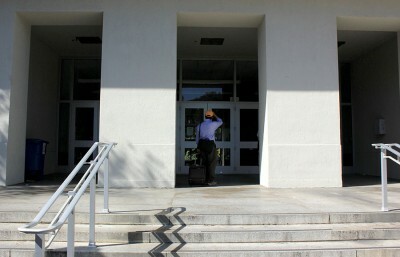 Although parts of buildings remained without power, students were still allowed in, he said. The outage also affected Cal Dining services Monday evening. Foothill and Crossroads will remain open with limited service, but Cafe 3 and Clark Kerr Campus dining commons will be unaffected, according to the Cal Dining Facebook page. “We got very, very lucky that there were no serious injuries,” Mogulof said. UC Berkeley senior Ana Reyes took video footage of the explosion. Staff writers Adrianna Dinolfo, Chloe Hunt and Chris Yoder contributed to this report. Executive News Editor Sara Grossman also contributed to this story. Megan Messerly and Jeremy Gordon are news editors. Contact them at [email protected] and follow the Daily Cal twitter page at @dailycal.